WINSLOW -- Area residents on Saturday were mourning the deaths of two Winslow High School students killed late Friday when, according to police, the vehicle they were in collided head-on with a taxi on South Reynolds Road. WINSLOW — Area residents on Saturday were mourning the deaths of two Winslow High School students killed late Friday when, according to police, the vehicle they were in collided head-on with a taxi on South Reynolds Road. Scott Loisel, 16, of Winslow, was driving north with passenger Alexandria Ferland, also 16, of Vassalboro, when their vehicle crested a hill at a high rate of speed, went onto a dirt shoulder on the right side of the road, darted across the southbound lane and hit the taxi, according to a statement issued early Saturday evening by police Lt. Josh Veilleux. The Elm City taxi traveling south in the 11:05 p.m. accident was being driven by Jamie Howard, 36, of Waterville, according to Veilleux. Riding in the front passenger seat was Brian Roy, 43, of Winslow; David Green Jr., of Belgrade, was in the back seat. Howard and Green were taken to MaineGeneral Medical Center’s Thayer Campus in Waterville. Roy was taken to Inland Hospital in Waterville, then transferred to Eastern Maine Medical Center in Bangor. All three were listed Saturday in stable condition, according to Veilleux, who responded to the crash with Officer Damon Lefferts. Lefferts is investigating the accident. Meanwhile, on Saturday afternoon at the crash site on South Reynolds Road, Loisel’s family members were trying to make sense of what happened. They walked along the road, inspecting the black tire marks and searching along the ditch for anything possibly left behind after the scene was cleared. Loisel’s uncle Ricky Loisel and his girlfriend, Kari Perry, of Clinton, said Scott was a good, giving person who had a sharp sense of humor. “He’d give you his last dollar, and sometimes I’d have to force him to take money when he worked for me,” said Ricky Loisel, owner of Rick’s Auto Repair and Sales, in Benton. In the family, Scott’s nickname was Bucky, and he loved cars and electrical work, according to his uncle. Scott often texted his uncle, asking if he still missed “Papa,” Ricky Loisel said. He said his nephew also kept his word. Perry said Scott Loisel had been a part of her life since he was 2 and wearing Teletubby boots and diapers and holding a bottle. Through her tears, she recalled his fourth birthday party, when he got packing tape from a box stuck in his hair and no one could get it out without hurting him. She had run out to the store, but returned and came to his rescue. “I just gently took the tape off and he didn’t even know it,” she said. A former Winslow football player who had the number 23, Scott loved school and would text Perry to tell her he was getting good grades, she said. Ricky Loisel and Perry said police told the family Scott’s vehicle was at the State Police Crime Lab in Augusta and that an autopsy on his body was scheduled for Monday. A full police report was not expected for 30 days, according to Perry. Rick Loisel said his nephew and Ferland, a friend, had left Ferland’s home Saturday night and were heading to his mother’s house when the accident occurred. 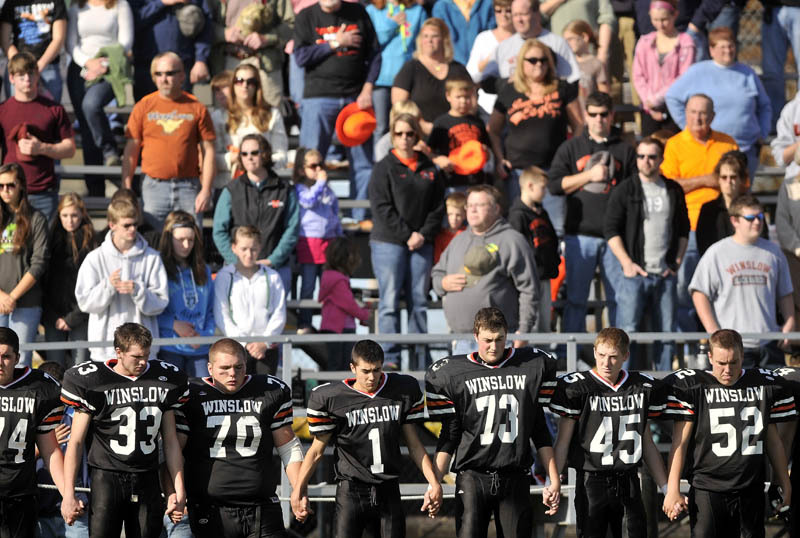 Later, in the parking lot at Winslow High School, after a football game in which Winslow played Yarmouth High School, friends of Ferland and Loisel were huddled in groups. Sky Belanger, a Lawrence High School student, said Ferland was a junior who transferred from Lawrence to Winslow a couple of months ago. Loreli Rich, 16, and L.J. French, 17, were sitting on the front steps of Winslow Junior High School. They said a moment of silence was held at the game for Loisel and Ferland, who were on everyone’s mind Saturday. French, also a junior, said Loisel was forgiving. He said Loisel’s best friend, Matt Fortier, wore his football number during Saturday’s game, at which everyone seemed to be having a hard time with the finality of the teens’ deaths. “The most shocking thing to me is, I sat in English class with Scott yesterday afternoon;n and this morning, he was gone,” Rich said. Counselors were available Saturday at the high school for those grieving the loss of Loisel and Ferland. According to Veilleux, South Reynolds Road was closed for several hours as Kennebec County Sheriff’s Sgt. Mike Pion reconstructed the accident. Sheriff’s officials, Waterville police and firefighters, Fairfield firefighters and Delta Ambulance also helped at the scene.